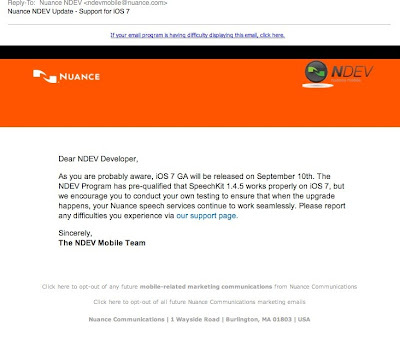 The blogosphere went nuts yesterday heightening the silly season chatter around Apple's major overhaul of their mobile operating system, iOS 7, when Owen Williams of Owened.com posted what appears to be a leaked notice from Nuance that suggests that iOS 7 will be released the same day as Apple's September 10 invitation only media event. According to Apple, iOS 7 will be released "this fall" and is compatible with the iPhone 4, iPhone 4S, and iPhone 5, iPod touch 5th generation, iPad 2, iPad with Retina displays, and the iPad mini. September 10th is just 14 days away. 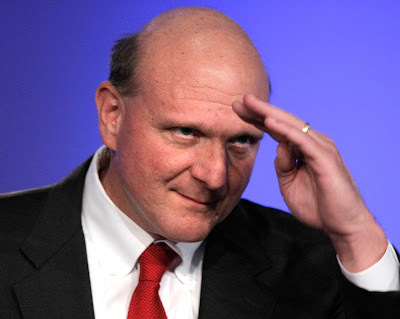 Patrick Moorhead, the principal analyst for Moor Insights & Strategy, said what we were all thinking about with Microsoft's announcement that CEO Steve Ballmer was retiring sometime in the next 12 months. "He was definitely pushed out by the board. They either drove him out, or put him in a situation where he felt he had to leave to save face." Moorhead is clearly talking about Microsoft's Board of Directors displeasure about the company's recent $900 million dollar write off of Surface RT tablets collecting dust in Microsoft warehouses around the world. 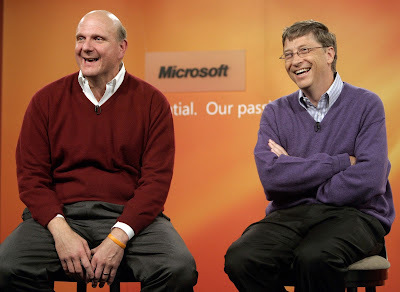 I give Ballmer credit for attempting to turn Microsoft into a devices and services company. In the long run, it's probably the right thing to do. But no one said it was going to be easy, or not without some serious risks, as I'm sure Steve is now well aware. Big news coming out of Redmond this morning. Microsoft CEO Steve Ballmer has announced that he will be retiring sometime in the next 12 months. In today's press release, Microsoft indicated that the Board of Directors has put together a special committee to search for a new CEO. The committee is being chaired by John Thompson. The full Microsoft press release can be found on the Microsoft website. 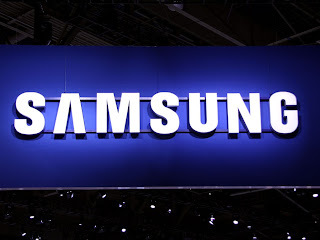 iPhone rumor silly season is in full swing, and to whet our appetites, a new leaked photo from a Japanese website leaves us clamoring for more. Yesterday, the above photo of what appears to be the metal casing for a champagne colored iPhone made the rounds. 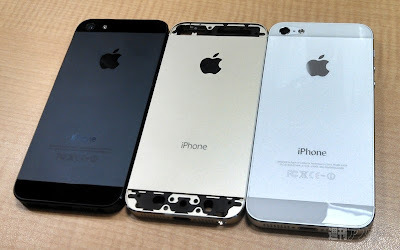 Flanking the gold assembly, is a current generation black and white iPhone 5. I'm looking forward to upgrading my iPhone 4S to a new iPhone 5S. The real question for me is what color should I get. I am waffling between black and white. 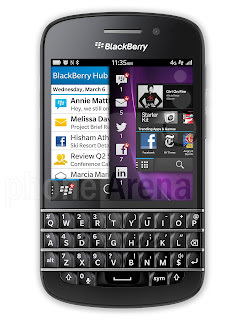 For the last six years, I've had a black smartphone. I'm thinking this time, I might opt for the white-but-sure-looks-grey-in-this-photo iPhone 5S. The white model looks like it would match my MacBook Pro. But I'm not sticking with anything until I click the "Confirm" button on the Apple online store website. 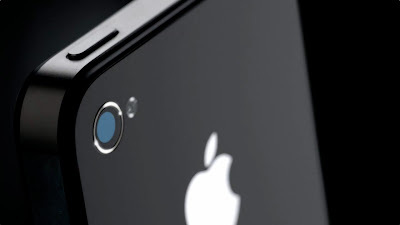 AppleInsider, via CNET, has discovered a news item on Japanese publication Nikkei that suggests that the iPhone 5S and iPhone 5C will launch in country on September 20. Reported to be available from SoftBank (the new majority owners of Sprint here in the US) and KDDI at launch. 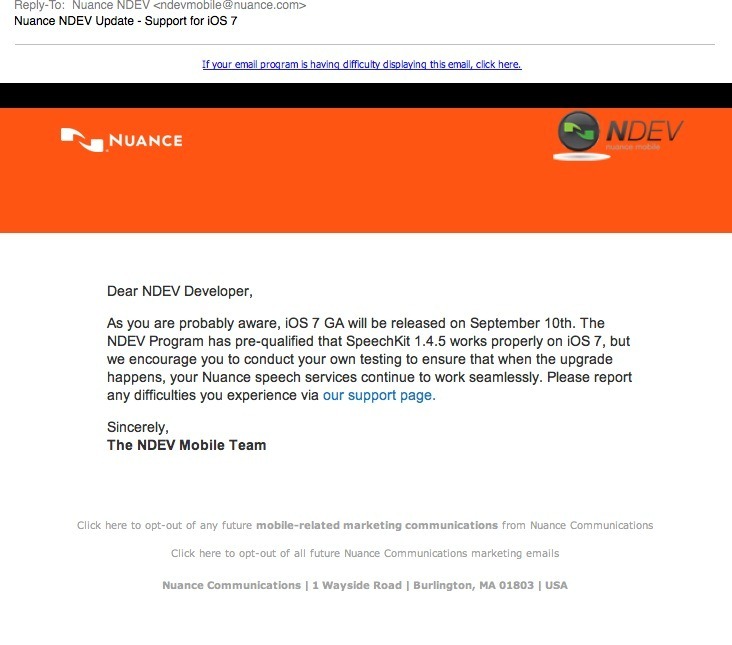 I think it's a safe bet to say that here in the US, we will get one if not two new iPhone models no later than Sept 20. 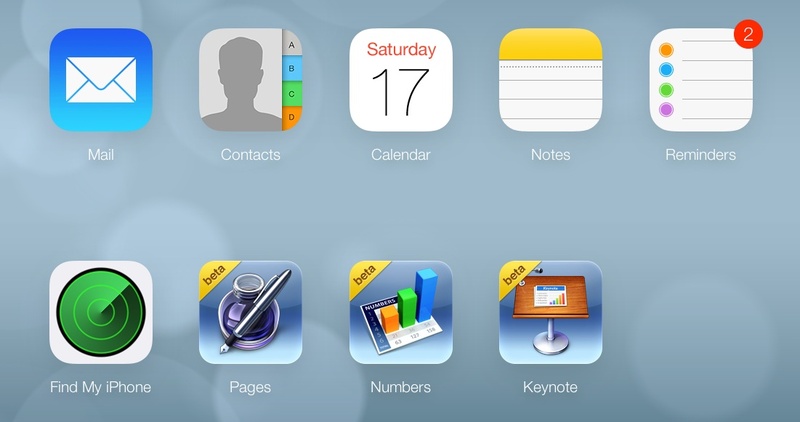 It has previously been rumored that Apple is planning a media event scheduled for Sept 10, a mere 20 days from today, to unveil - and possibly launch - iOS 7 and the next generation of iPhones. The wait for Plants vs. Zombies 2: It's About Time is finally over and is ready for you to download to your favorite iOS device now! 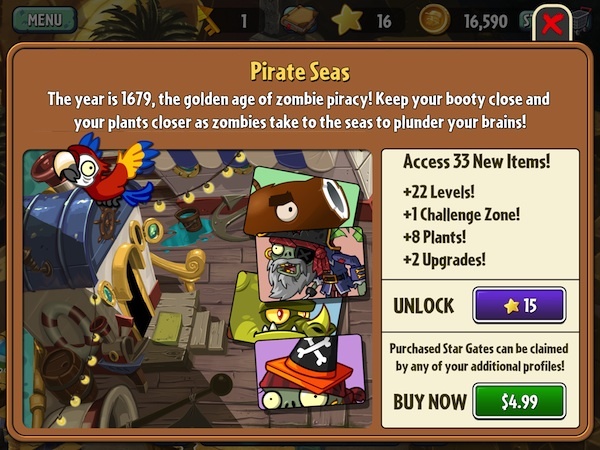 Unlike the original game, PvZ2 is a "freemium" game, meaning that the game is free to download and play, however, there are many in app purchases that cost money. I really don't like freemium games because most games of this type start out easy enough, but after a few levels, they become increasingly difficult and you have to start paying real money to move up in the game. The good news about PvZ2 is that in my experience after playing the game for a weekend is that you don't have to buy any power ups to defeat levels and move on to the next level. While you don't have to buy any upgrades, I did purchase one upgrade - the $3.99 extra seed tray. It was an upgrade that I purchased with coins in the original and I wanted to have that same ability in the sequel. New locations spice up game play. Crazy Dave has also added new power ups to help fight zombies. Once you've won the level, play these mini games to collect stars to get to the next level. 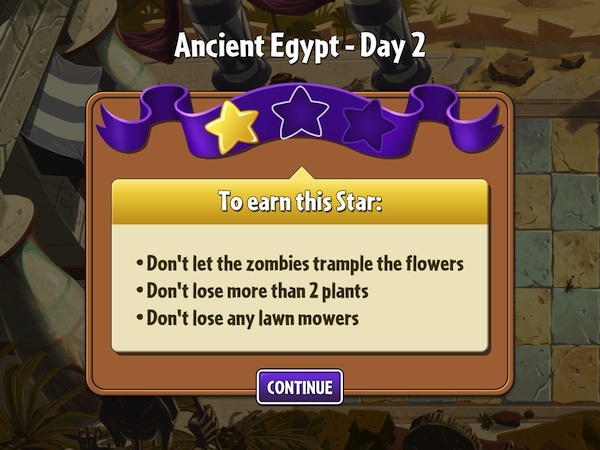 Unlike the original, PvZ2's mini games are built right into the main game. Once you have completed the necessary boards in a level, you need to go back and replay some boards to collect stars. You use your collected stars to unlock the next level; or you can pay $4.99 as an in app purchase to skip directly to the new level. This dynamic can be challenging as my younger daughter tells me, but if you put a little time an effort into beating these mini game/challenge levels, you can win without having to buy power ups. Choose your plants. Use In App purchases to get popular plants from the original game. 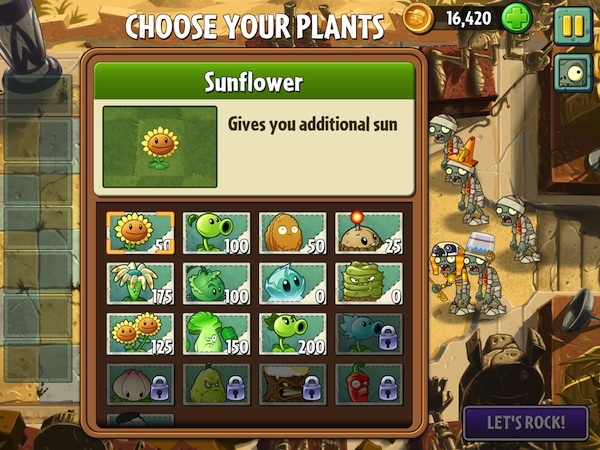 While I am glad that you can play PvZ2 without having to purchase anything, I am annoyed that you have to purchase some of my favorites plants from the original game that were included for no extra charge, such as the Snow Pea ($3.99), the Jalapeño ($2.99), Squash ($2.99) and Torchwood ($3.99). Collect start to unlock the time portal to the next level. Don't want to collect stars? It'll cost you to advance right away. In the original buy-it-once-and-you-get-everything Plants vs. Zombies, you purchased the game and that's it. You're done. There is nothing else to buy that costs real money. 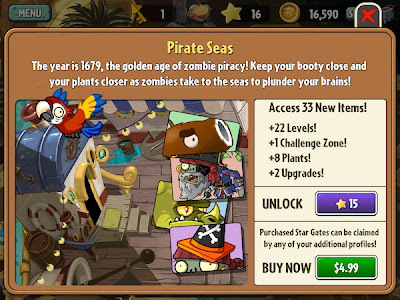 In PvZ2, PopCap has changed this. There are four new power ups that add a new game mechanic to PvZ. The first is Plant Food. Plant food is something you can collect while battling zombies or purchase with coins that you pick up along the way. If you don't have 1,000 coins, no problem. You can just do an in app purchase to buy more. You can also use those game coins, either collected or purchased, to buy more uses of the other power ups: Power Pinch, Power Toss, and Power Zap. These power ups, provided by Crazy Dave, do just they sound like. Power Pinch allows you to use a two finger pinch attack on zombies to pop their heads off. Power Toss allows you to pick up zombies and then flick them off the game board. Lastly, Power Zab allows you to electrocute the zombies and burn them up in their tracks. When you activate a power up you only get a few seconds to use them. They are great for getting out of a jam when you are trying to fortify your defenses and the dreaded huge wave of zombies message appears on screen. My advice is to use them sparingly as you will need more coins to recharge the power ups and if you don't have enough, you can always get more coins via, yup you guessed it, an in app purchase. My advice is to use them sparingly. If you are thinking a move or two ahead in the game, you can get "buy" without them. In today's day and age with the NSA snorting up all sorts of personal and private data about us, any little thing you can do to protect your privacy is a good thing. 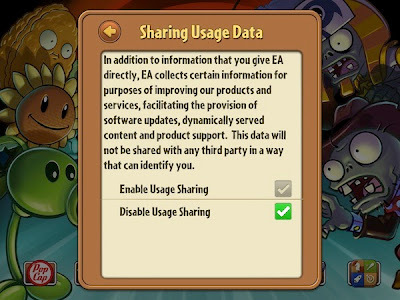 Tucked away in the settings for PvZ2 is the setting for "Sharing Usage Data." Defaulted to "Enabled", this option allows PvZ2 to pass along your game playing usage data to EA. EA's in game verbiage says that the date won't be shared, and that may be true, but I'd rather just turn off the option all together. Plants vs. Zombies 2: It's About Time is a good game that extends the fun of the original into new worlds, levels, and game play. The game is free to download, but you'll need to watch out for in app purchases. If you have little ones, it might be a good idea to turn on the parental controls features of iOS and disabling in app purchases of any kind. I've done this for my kid's iPod touch handhelds and I don't have to worry about coin buying sprees while I'm at work. 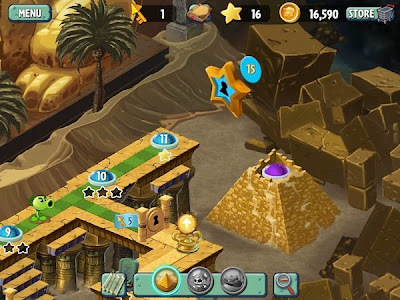 The game play is easy to learn and master and the replay value is there for a few replays. After I have played a board three or four times I'm pretty much ready to move on to the next board or level. The animation of the plants and zombies is still cartoons that gives the game a cute an innocent feel that won't make you rethink your decision to allow younger child to play. If you liked the original game then you will like PvZ2. 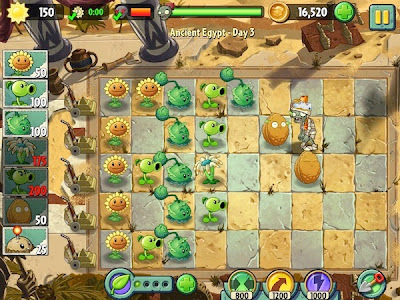 If you are new to the PvZ world you won't have to have played the original to get into and enjoy the sequel. 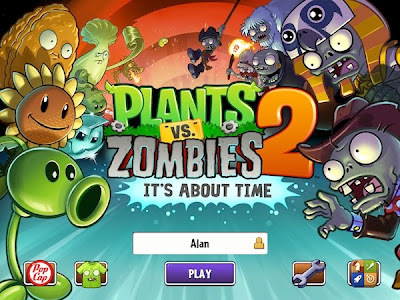 Plants vs. Zombies is available as a free download now. 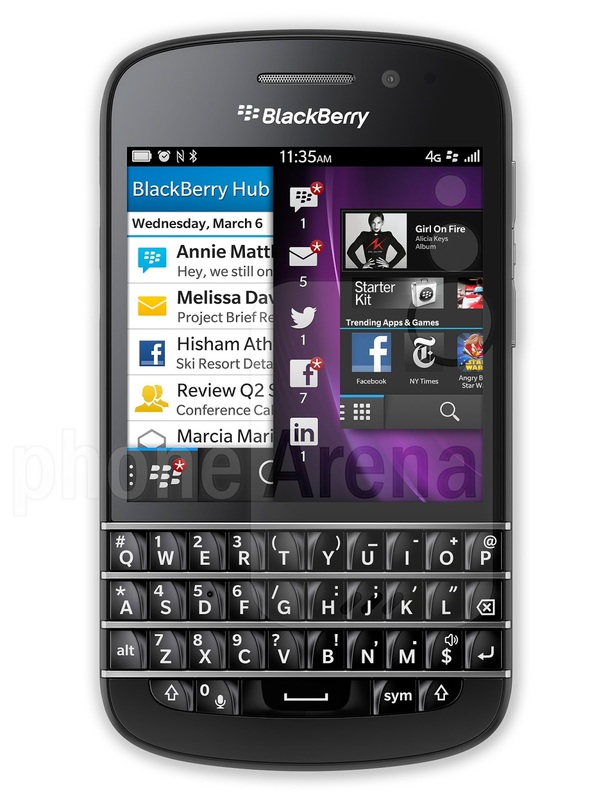 It is also a universal binary which means that the one download will work on your iPhone, iPad, or iPod touch.